Hakusan, Japan, March 17, 2015 – EIZO Corporation (TSE: 6737) today announced the release of the ColorEdge CG248-4K, a 23.8-inch monitor with a UHD (ultra-high-definition) 4K (3840 x 2160) native resolution for creative professionals who work with high-resolution content such as photography, print, and video. The ColorEdge CG248-4K features the highest pixel density yet in the ColorEdge lineup at an astonishing 185 ppi (pixels per inch), making high-resolution image display smoother than ever. This allows professionals to display the high level of detail captured in 4K photographs with exceptional clarity. Alphanumeric characters and contours are also distinguished with excellent sharpness for the printing workflow. The ColorEdge CG248-4K comes with a built-in sensor to enable self-calibration for hassle-free monitor maintenance. EIZO offers two dedicated calibration software programs, ColorNavigator 6 and ColorNavigator NX, that let users set target values for brightness, gamma, and white point and generate an ICC profile. ColorNavigator 6 comes bundled with the monitor and is for individual users that require additional functionality such as manually adjusting the properties of a calibrated monitor. For color management of the ColorEdge CG248-4K and other select ColorEdge monitors on a network, EIZO also offers ColorNavigator Network, a secure, cloud-based web hosting solution for administrators to perform quality control (QC) tasks on client ColorEdge monitors with ColorNavigator NX installed. ColorNavigator NX is available as a free download from eizoglobal.com and is for organizations the want to centralize quality control of their monitors. The ColorEdge CG248-4K uses an LED-backlit IPS (in-plane switching) LCD panel with a wide color gamut that covers 99% of the Adobe RGB color space. It also covers 100% of the Rec. 709, EBU, and SMPTE-C standards, as well as 77% of Rec. 2020 and 93% of the DCI used in post production to ensure faithful color reproduction for a multitude of creative industries. A typical monitor takes 30 minutes or more for its brightness, chromaticity, and tone characteristics to stabilize but the ColorEdge CG248-4K takes only three minutes, so professionals can count on reliable color soon after turning the monitor on. Accessible using the monitor’s front keys, a 4K zoom function enlarges specific areas of the screen enabling photographers to quickly check details and focus accuracy in images. The ColorEdge CG248-4K comes with a sleek new cabinet design that blends well with a working environment. It is as practical as it is aesthetically pleasing with LED backlit buttons for dimly-lit studios, a carrying handle and cable holder on the back, and three USB 3.0 downstream ports on the side. It also has an ergonomic stand with 150 mm height adjustment, 40° tilt (-5° – 35°), and 344° swivel as well as portrait mode capability. 3D LUT (look-up-table) that adjusts color individually on an RGB cubic table. Two DisplayPort (ver. 1.2) and two HDMI connectors. 10-bit display1 (more than one billion colors simultaneously) from a 16-bit look-up table. 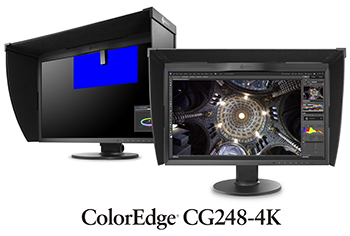 The ColorEdge CG248-4K will begin shipping in April, 2015. Date of availability will vary by country. ColorNavigator Network is currently available. Please contact the EIZO subsidiary or distributor in your country for details about both products.